Sport fishing (also known as bluewater fishing or deep sea fishing) on the “Mad Son” is a unique experience unlike any other you will have anywhere else in or around Jupiter, West Palm Beach or Singer Island. Captain George and his crew know the area and know how to make your trip an enjoyable and memorable. 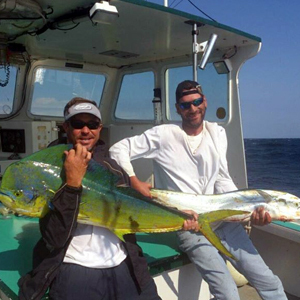 Even our sport fishing charters offer plenty of opportunities to catch and keep if you so desire. We can even clean your catch and suggest nearby restaurants that will cook your catch. Charters on the “Mad Son” launch from the Lake Park Marina and traverses the area between the Lake Worth Pier and the Jupiter Inlet. However, if the fishing report states a much wider range, Captain George will go as far as Stuart, Port St. Lucie or 30 miles offshore. Our goal is to give you the best sport fishing experience possible—each and every trip. 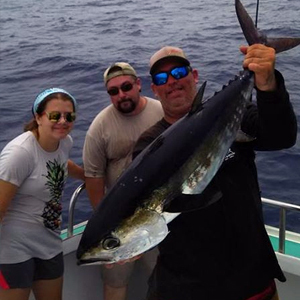 Some of the fish regularly caught on these trips include dolphin Mahi Mahi, sailfish, tuna, and wahoo. However, an unexpected blue or white marlin may show it’s face in the spread, when an experienced angler knows you never know what to expect. While a few fish are catch and release, you can keep much of what you catch—depending on size. Our crew will keep you up to date with the current information. 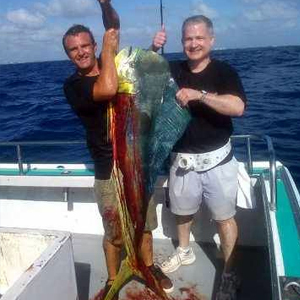 At Mad Son Fishing Charters, we book our sport fishing excursions only as four or eight hour private charters. Our boat comfortably holds up to 6 fishermen, plus our crew. This intimate experience gives you the one-on-one attention from our crew you deserve, which is perfect for both novices and more experienced anglers. We are also available for fishing tourneys; you will pay the standard charter fee plus your tournament entry fee. A day of sport fishing on the “Mad Son” is something you will never forget. All equipment is provided, but you are welcome to use your own if you prefer. Please bring your own snacks and drinks for the trip. If you would like to learn more about sport fishing with us or book your sport fishing trip, call (561) 324-3454 today. We look forward to hearing from you.